In 1973, Edward de Jaegher of Brussels, Belgium, became the first foreign-trained lawyer to earn a Master of Laws, or LL.M., degree at the University of Georgia School of Law. In the ensuing four decades, the law school and its Dean Rusk International Law Center have produced more than 500 LL.M. graduates, with ties to 75 countries and every continent in the world. Our LL.M.s include judges and law firm partners, leaders in governments and in intergovernmental and nongovernmental organizations, CEOs and heads of corporate legal departments, and university professors and administrators. 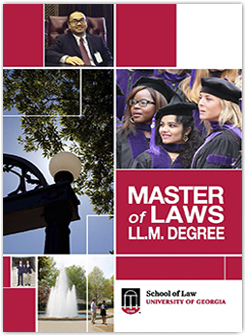 They form a valued part of the law school’s vast network of more than 10,000 J.D., LL.M., and M.S.L. alumni and alumnae. Along with our Dean, international arbitration expert Peter B. “Bo” Rutledge, all of us at the University of Georgia School of Law welcome you to apply now to join this storied tradition of global practice preparation. As a member of our select class of LL.M. students, you will pursue a one-year, full-time plan of courses side by side with J.D. candidates, gaining exposure to diverse viewpoints on a range of legal issues. You’ll follow a flexible curriculum tailored to your own career goal, whether it is preparation to sit for a U.S. bar examination, pursuit of a Concentration affording advancement in your home country’s legal profession or academic institutions, or something else. You will benefit from the superb resources of a highly ranked law school in the heart of a top-20 public university: renowned faculty; research facilities like the Alexander Campbell King Law Library, as well as the Louis B. Sohn Library on International Relations at the Dean Rusk International Law Center; experiential learning opportunities; professional development and career preparation; and world-class lectures and conferences. Transfer from LL.M. to J.D.